Congratulations to "LS" and "Martha L", the winners in Winter's giveaway. Thank you to all who participated! In a sniper’s world patience is more than virtue. It’s a matter of life and death. Life for those the sniper is protecting and death for the target. Whether the sniper is military or police, on the other end of that scope is a decision that must be made by the person wielding the gun. And for the greater good, death is usually the choice being made. But what happens when a sniper decides that’s not enough anymore? What if it becomes more about how much the sniper and his skills are worth, than the value of human life? This was the revolving question that brought me to write my second book, Retribution, in my Degrees of Darkness series. Here was the problem: I didn’t know much outside of the little bit I researched online about snipers. In fact I wasn’t even sure which rifle was the best to be used. Enter one dedicated sheriff’s deputy who also is a police sniper and one great consultant who loves to read. An author’s greatest resource for accuracy, especially in the law enforcement world, are consultants within any given agency. In my case, I was able to get inside the head of a sniper, learn how they think when they’re on the other side of that scope. Right down to the details of what you might find in their pockets, how to read environmental conditions and how the bullet arcs through the air, or DOPE—Data on Personal Equipment. We even hashed out which rifle(s) were best used in this novel by the characters wielding them, which turned into an interesting time video researching each rifle along with my gun-nut husband. My phone conversation with the police sniper was insightful, as were the many e-mails thereafter. Once I completed the novel my consultant was gracious enough to read through the book and let me know that I was good to go. He wasn’t the only person to help me out. My long-suffering military husband got in on the action, too. In fact I think he had more fun than me in working out the angles, the distance, the mentality of everyone involved in the scene. I sure enjoyed watching him calculate and formulate a strategy that eventually ended up being the biggest blow-out ending of my current published novels so far. I thoroughly enjoyed writing a novel with snipers in it. So much, that I started another one separate from my current series. One day I hope to finish it, because that novel is a deeper look inside that lifestyle. Winter is giving away a digital copy of Retribution to 2 lucky commenters or e-mail entry. Under normal circumstances, after completing a hit, The Assassin took the first flight to nowhere. But part of this contract killing was to stick around and wait for the body to be discovered—however long it took. Two days wasted. Cursing greed, The Assassin shifted under the camouflage canopy. A fat bead made a slow trek along corded arm muscles. Sprawled on a Dallas rooftop during the middle of the day in ninety-degree heat was borderline suicidal. The last few days of April were not kind to the residents of Dallas. Yet this was nothing compared to the jungles of South America or the African deserts. The Assassin went where the money paid. This hit had come in with a special request, one without rhyme or reason. The target, a nobody as far as the recon had revealed, was unconventional: A defense lawyer with no known connection to anyone of importance. Lately, the contracts for the nobodies were coming in faster than the somebodies, it was a scenario The Assassin quickly adjusted to. From the chest, a quickening of the heart. Four buildings away, the equivalent of almost six hundred yards. Through a thick windshield, The Assassin had placed a single bullet to the center of the target’s head. A beautiful shot. No one did better. Bringing the binoculars up, The Assassin leveled the sights on the lone car. Finally, this special condition of the contract could be marked off. The cops were there. Patrol officers, crime techs decked out in paper getups, and two men in suits swarmed the rooftop parking lot. A familiar face made The Assassin hesitate in lowering the binoculars; adjusting the sites to zero in on the man in the gray suit. Dark brown hair, and the weathered features of … a Frenchman. Gripping the binoculars tighter, like they were the gray-suited man’s neck, The Assassin watched him stride across the roof. He was supposed to be dead; so The Assassin had heard through the network. Killed by Hurricane Katrina. His body swept away in the flood waters. Giveaway ends 11:59pm EST June 11th. Please supply your email in the post. You may use spaces or full text for security. (ex. jsmith at gmail dot com) If you do not wish to supply your email, or have trouble posting, please email maureen@justromanticsuspense.com with a subject title of JRS GIVEAWAY to be entered in the current giveaway. Jemi, I believe it does, but I'm the author so I'm biased. So far early reviews on the book the readers seem to think so. That was wonderful that you had a person willing to share so much knowledge with you. Yes, Maureen, and I lucked out that he's an avid reader. Luckily he spends a lot of his time helping authors, even participates in a special conference for authors like myself who write suspense/thriller/mystery novels. He's used to it. You are a new to me author, I love finding them and their books! This one looks amazing and I'd love to be entered to win it. Thanks for the chance. I've never read a book about a sniper before. Happy to now though. The research would have been fascinating I dare say. Mary, it was extremely fascinating. I spent a lot of time viewing videos and documentaries on certain aspects, but actually talking with someone who did it for a living was great.. I'm all about new readers. Thank you for sharing a bit about book 2 with us... RETRIBUTION sounds great! This book sounds fascinating - thanks for sharing! 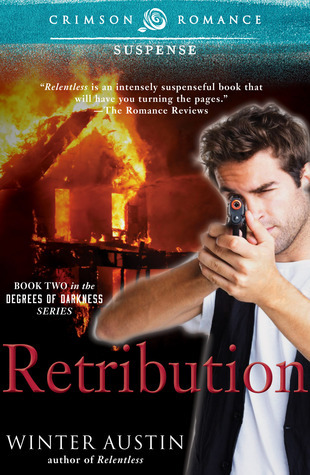 Retribution and Relentless sound like an action-packed books with romance. These two books are going on my must-read list. Thanks for the interview and giveaway.